Some time ago I received a vintage Nintendo catalogue as a gift from a fellow collector. This catalogue shows the range of playing cards that Nintendo had for sale in Japan in the early 1980s. It was produced for sales staff and toy store buyers. 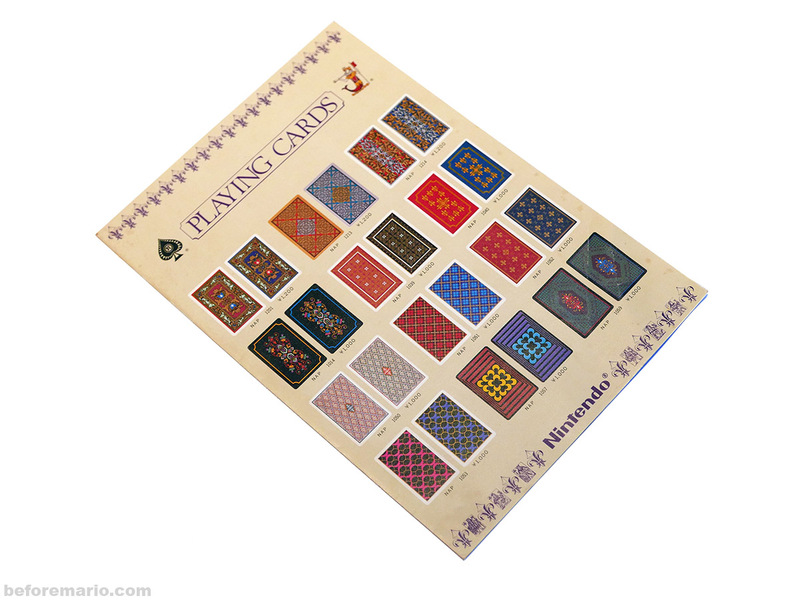 It was printed on heavy paper not unlike that of playing cards and was clearly intended to highlight Nintendo's ability to produce print work of the highest quality. The six-page catalogue dates from July 22 1983 (printed on the catalogue using the Japanese calendar: 昭和58年7月22日). To put this date into perspective in Nintendo's history: this was one week after the release of the Family Computer. Although Nintendo was very busy conquering the world of electronic entertainment, at the same time it also still carried a substantial range of playing cards (in fact, it still does so today). The first four pages are used to showcase Western style 'trump' (トランプ) playing cards in many different geometrical designs. 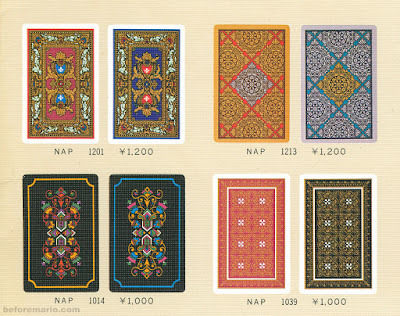 The designs are presented in pairs with slight colour variations, intended for games that require two card stocks to play. Various levels of quality are offered which differ in card material, size and thickness. Prices range from ¥1,200 for the most expensive to ¥500 for the simplest set. Most of these cards are made from plastic. 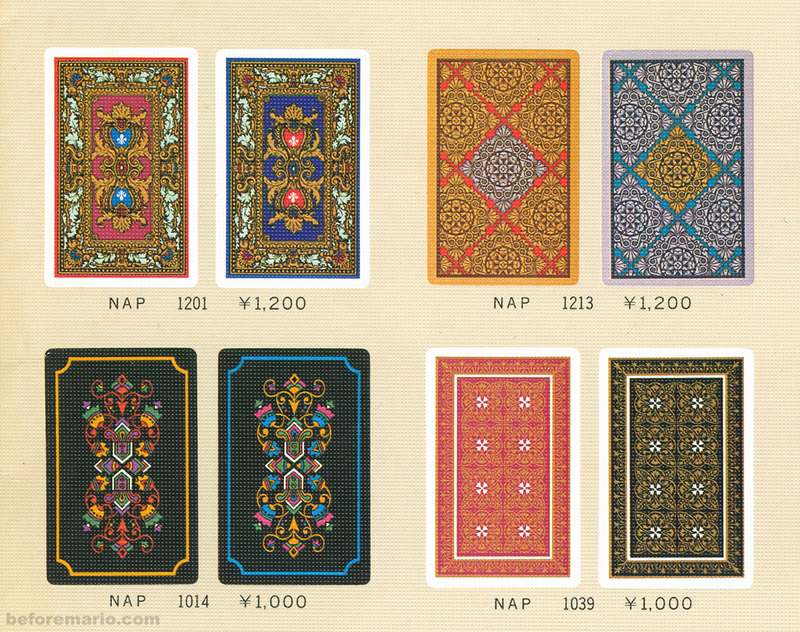 This is also reflected by their product codes: all cards with codes that include 'NAP' are plastic. 'NAP' is short for 'Nintendo All Plastic'. In 1953 Nintendo started producing playing cards that were made entirely out of plastic. It was the first company in Japan to do so. Although printing on plastic complicated the manufacturing process - as the ink smears more easily and takes longer to dry - it produced much more durable cards that retain their shape and colour better. 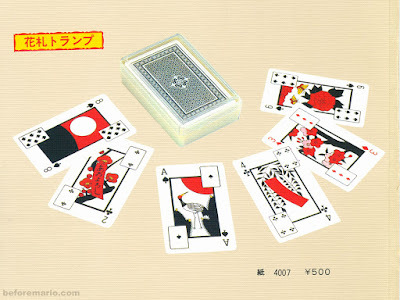 Not all offered cards in this catalogue are plastic though; some of the cheaper sets are made from paper, as indicated with the kanji for paper (紙).